Also, the unique modular structure of Lightroom adds another level of complexity. Sometimes, it feels that each Lightroom module is a stand-alone application with its unique tools, shortcuts and functionalities. I believe that if you learn how to purposefully use the zoom functionality in different areas of Lightroom that you can save time and improve your editing by making it more fluid and less interrupted. In this article, I illustrate how I use the zoom functionality of Lightroom throughout my editing process from start to finish. Trust me, it’s more complicated and sophisticated than you think. The most apparent and uncomplicated zoom control that is familiar to all Lightroom users is merely clicking anywhere in the selected photo in a single image (Loop) view. Doing this causes it to zoom into a previously used (default) zoom magnification level. Clicking a second time anywhere in the image zooms out and takes you back to the original view. You can change the default magnification levels but this is a more advanced feature that you will learn more about in this article. Few photographers use the zoom functionality in the Import Module, including me. The idea of evaluating the photo before bringing it into the Lightroom catalog with the option to discard it if necessary is a very compelling proposition. 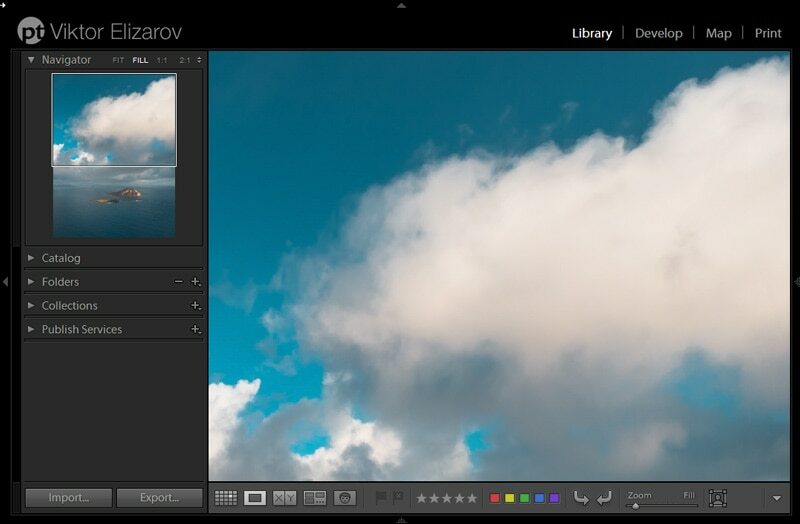 But, the issue is that before a photo is imported to Lightroom, there is not a high-quality preview available and the only option for evaluation is to embed a low-resolution JPEG inside a RAW image. Occasionally, when I am back from a day or half-day trip with only a handful of photos, I might use the Import Module to identify and discard unwanted shots. Ctrl +/- on a PC (plus/minus) or Cmd +/- on a Mac (plus/minus)to go through 8 zoom levels. Ultimately, you can use the Zoom slider on the right side of the toolbar below the photo. The primary function of the Library Module of Lightroom in my workflow is to identify the photos I might consider for developing and publishing (the keepers). This process is also known as culling. My culling process consists of two stages. First, I go through all the newly imported photos one by one with a single purpose—to identify all the inadequate shots, the ones that can never be used, and flag them as rejects. For example: out of focus or blurry shots, or accidental shots of my boots. Second, I go through my photos again with the goal of pinpointing the best shots I consider for developing and ultimately publishing. I flag these as keepers. Lightroom’s zoom functionality is an essential part of the culling process since I zoom in on different areas of the photo before making my decision as to whether the selected photo is a reject or a keeper. I start culling by hitting the TAB key to hide both the left and right panels. Since I do not need any tools during the culling process, I like to keep my workspace uncluttered. I go through photos in a single (Loop) image view one by one using the arrow key. 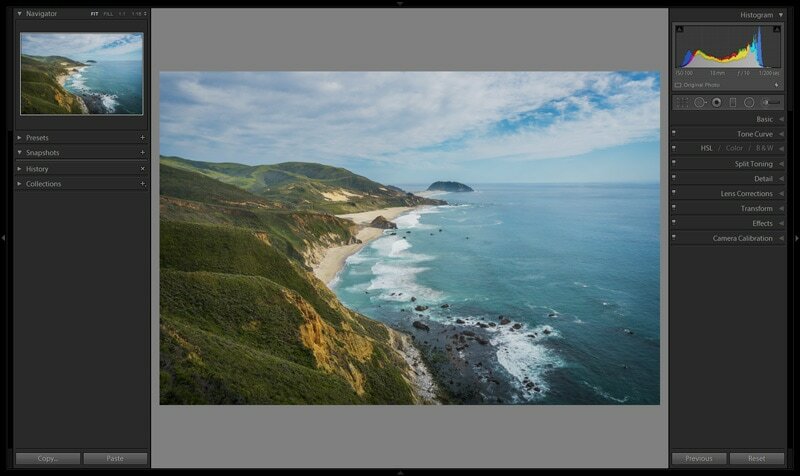 When I am not entirely sure if the selected picture is a keeper or not, I hit the “F” keyboard shortcut that tells Lightroom to take over the entire screen and display the photo in “full screen.” When I hit “F” a second time, it takes me back to the single image (Loop) view. At this point in my culling process, I am typically ready to make my decision. But, if I still need more data, I use a more selective evaluation. I hold the SPACEBAR down and use the Hand Tool to pan around the image to evaluate the various areas of the photo. The Hand Tool only appears when the spacebar is down. 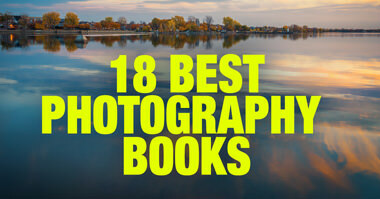 In most cases, I examine if I nailed the focus and if the right areas of the photo are perfectly sharp. When I am finished examining, I release the SPACEBAR and am back where I started. Here is a small, but critical detail. When you hit the SPACEBAR, it goes to the previously used zoom level. When evaluating images, I want to always use the 100% magnification and, to ensure 100% is the default value, I must click the 1:1 icon in the Navigator Panel. By hitting the keyboard shortcut “Z” once, it takes you to the previously used zoom level. By hitting “Z” a second time, it brings you back to the original zoom state. Use the shortcuts Ctrl +/- on a PC (plus/minus) or Cmd +/- on a Mac to go through the four active magnifications levels defined in the Navigation Panel. By using shortcuts Ctrl Alt +/- on a PC (plus/minus) or Cmd Alt +/- on a Mac, it goes through all 13 existing magnification levels. 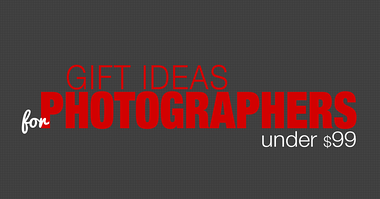 When I switch to the Develop Module of Lightroom, this means that I have a particular image that I want to work on. It also means that I no longer need the navigational menus. I start my develop workflow by hitting the F5 and F6 keys to hide the top and bottom filmstrip panels. I want to maximize my workspace and have direct access to the presets on the left panel and the editing sliders on the right panel. I most often use basic zoom controls in the Develop Module. I magnify the specific area I am planning to edit by clicking on the image. This takes me to the 100% zoom level. I use the Hand Tool to pan around as necessary. Depending on the photo, I use various selective editing tools like the Adjustment Brush, Radial Filter, Spot Removal and so on. When I am finished, I click anywhere in the image to return to the original size. On rare occasions, when I need to zoom beyond 100%, I use the Navigator Panel to select the magnification level needed. The second zoom control I use in the Develop Module is the “F” shortcut. Once again, this takes the photo into full-screen mode and allows me to better examine my editing progress. Since my Sony camera does not have GPS tagging functionality, I use the Map Module to manually geo tag my photos. Before uploading the photos to SmugMug, I make sure every photo has GPS coordinates embedded into the metadata. There are two zoom controls I use a lot that are unique to the Map Module. First, I use the mouse wheel to zoom in and out the same way the wheel works in the web version of Google Maps. I love this feature and wish it was implemented into both the Library and Develop Modules. Second, by pressing the Alt (Win) or Option (Mac) key down and dragging the rectangular area on the map, I can zoom in to a specific area. Priceless. You can also double-click to zoom in, but to zoom out, you must use the zoom controls or the mouse wheel. 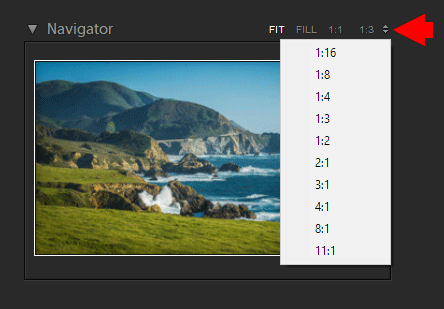 The Navigator Panel offers a variety of controls and options for zoom functionality in Lightroom. At the top of the Navigator Panel, you will find four icons that represent the active zoom levels. Three of the zoom options are constant and the last is selectable. I always set the selectable option to 2:1. This means that when I use shortcuts like Ctrl +/- on a PC (plus/minus) or Cmd +/- on a Mac, it goes through all four active zoom levels in succession. Optionally, you can use Ctrl Alt +/- on a PC (plus minus) or Cmd Alt +/- on a Mac to go through all 13 of the predefined zoom levels. As you already know, when you use the “click to zoom” functionality or the “Z” shortcut, it toggles between the last used magnification levels. Since the “Fit” and “1:1” zoom options are the most useful in my editing, I set them as defaults by clicking on the “Fit” and “1:1” icons in the Navigator Panel before I start my editing session. The “Fit” magnification option is obvious and uncomplicated. 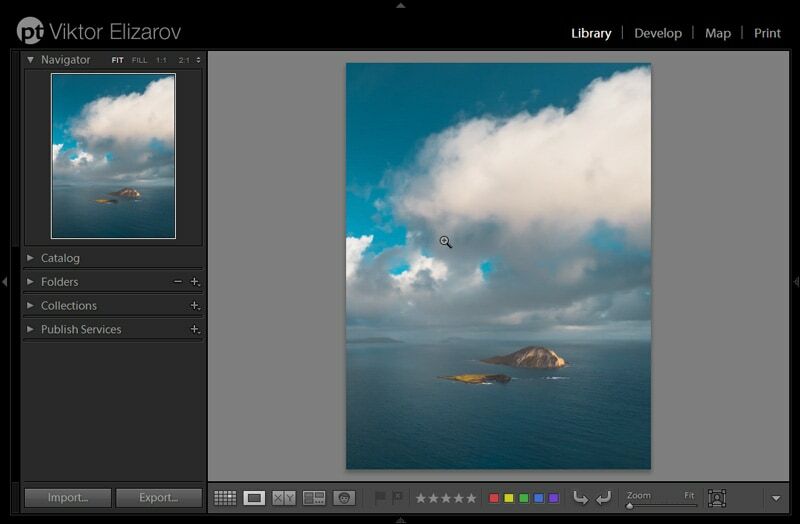 Lightroom automatically selects the magnification level to fit the entire image inside the available working area. The “Fill” option is more confusing and less apparent. 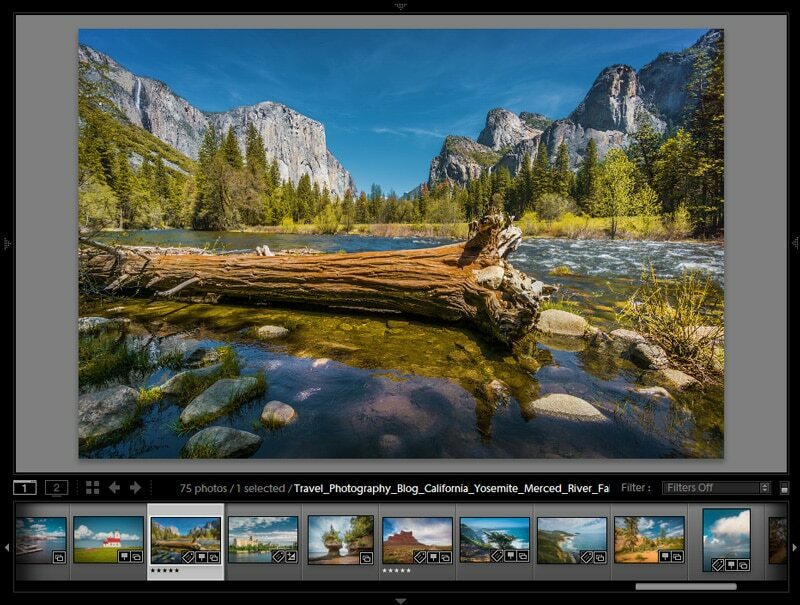 Lightroom selects the magnification level to fit the shortest side of the image, making sure the entire working area is filled. I do not find the “Fill” option to be very useful for my workflow and wish there was an option to hide it. When you edit a high pixel count image and use the “1:1” zoom magnification, it is easy to get lost and not know what part of the image you are exploring. This is when the Navigator Panel can help. After zooming in, you can drag the white rectangle inside the Navigator Panel to move around the image. When I work on a portfolio piece, I want to make sure that every area and pixel of my final photo is processed correctly—that I removed all the artifacts caused by sensor dust and did not miss any noisy spots during noise reduction. The process can be time-consuming when dealing with high-resolution images. This is when I use one of my favorite features in the Navigator Panel. I click the 1:1 zoom option or use the shortcut to reach a 100% magnification level. I hit the “Home” key, which tells Lightroom to place the white rectangle in the top left corner of the Navigator Panel. Next, I start hitting the “Page Down” key and Lightroom methodically goes from one area to another without missing even one pixel of the photo until it reaches the bottom right corner. This helps me assess the entire image in a very short time. Very clear and thorough, Viktor. Thanks, as always. I’ve been looking for something like this for a while. Very informative. Thank you – was working a lot in Lightroom this past week and was totally confused about the zooming. This is very helpful.